BRIDGEPORT, Mich. – (August 1, 2018) – William Stenger feels obligated to keep a clean cab, and is happy to do so. 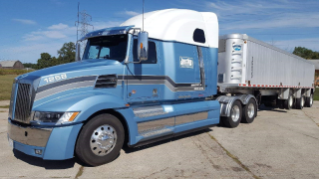 Stenger, co-owner of Junction Leasing LLC, drives a 2018 Western Star 5700XE that turns heads with its striking blue-and-white custom paint job and an 82-inch Ultra High Roof Stratosphere sleeper. Junction Leasing primarily hauls animal by-products, some of which is converted to biofuel. It’s been a steady and profitable business that allowed Stenger to buy the company’s first new truck in decades. 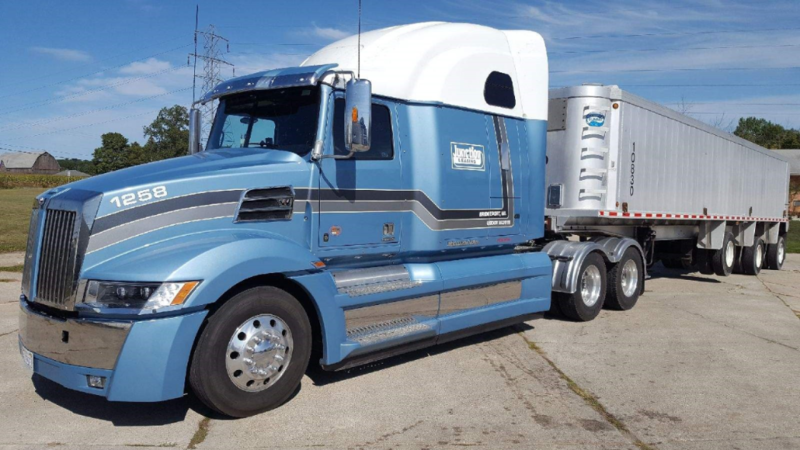 He first saw the 5700XE at the Mid-America Trucking Show in 2017 and was struck by its aerodynamic design and overall style. He’d been looking for a truck that stood out from the crowd and the 5700XE certainly does that. While he’d never driven a Western Star, he knew from experience that he wanted the Integrated Detroit™ Powertrain in his new truck. Stenger’s family also owns Junction Garage in Bridgeport, Mich., which does heavy truck repair, and his hands-on work there has convinced him that Detroit makes the best powertrains on the market. “They’re reliable and easy to work on and it’s definitely the platform I wanted,” he said. Stenger also chose the Integrated Detroit Powertrain option for its superior fuel economy benefits. The powertrain in his truck comprises a Detroit DD15® engine, Detroit DT12™ automated manual transmission and Detroit front and rear axles designed to work together to deliver optimal efficiency, performance and reliability. It was sitting in the cab of the 5700XE convinced him it was time for a new truck. “It was beautiful, comfortable, well-designed and solid,” Stenger said. He ordered it from Brian Pratt at D&K Truck Co. in Lansing, Mich. For the interior, he chose Mordura cloth seats and wood cabinets in addition to the largest and highest sleeper.